The molecular basis for MAPK4 binding to AKT, part 1. (A) The domain architecture of human MAPK4. MAPK4 contains an N-terminal kinase domain (aa20 to aa312), a conserved C34 (aa313 to aa462) motif shared between MAPK4 (Erk4) and MAPK6 (Erk3), and a C-terminal tail. Asterisk indicates phosphorylation site. (B) HEK293T cells were transfected with FLAG-tagged AKT1 and HA-tagged WT or C-terminally truncated MAPK4 including N462, N312, and N185. Immunoprecipitation was performed using anti-FLAG M2 affinity gel followed by Western blots using anti-HA antibody. The kinase domain of MAPK4 binds to AKT1 and the aa186–aa312 fragment is essential for this interaction. (C) His-tagged AKT1 along with FLAG-tagged MAPK4 and MAPK4S186A mutant were reconstructed into the DLD1 AKT1/2-KO cells that lack all 3 isoforms of AKT. Immunoprecipitation was performed using anti-FLAG M2 affinity gel followed by Western blots for phosphorylation of AKT and total AKT. WCL: whole-cell lysate. 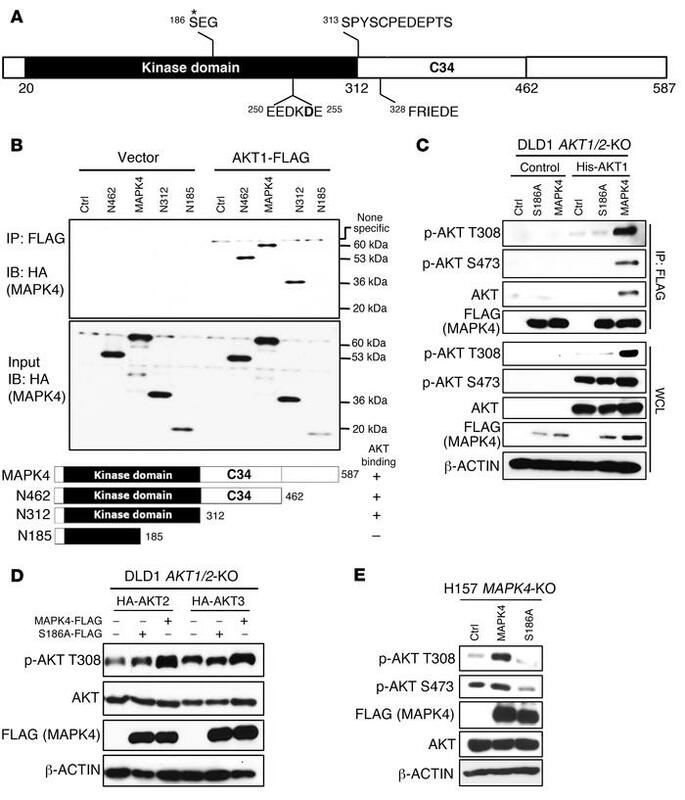 (D) HA-tagged AKT2 and AKT3 were reconstructed into the DLD1 AKT1/2-KO cells along FLAG-tagged MAPK4 or MAPK4S186A mutant. Western blots using Phospho-AKT T308 antibody were used to detect the phosphorylation of AKT2 at T309 and AKT3 at T305, respectively. (E) FLAG-tagged MAPK4 and MAPK4S186A mutant were transduced into the H157 MAPK4-KO cells. Western blots were used to determine AKT phosphorylation. Ctrl: control. Data are representative of at least 3 independent experiments.